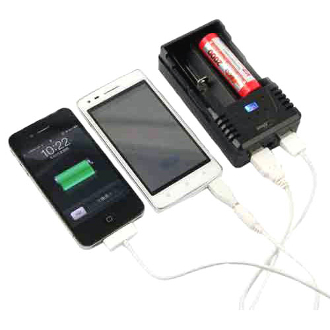 The Efest BIO V2 charger is a two slot charger manufactured by Efest power. This little charger packs a lot of power. It has a reverse-polarity feature and comes with a car charger so you can charge while you drive. It also has duel USB ports to charge other electrical devices such as cellphones and tablets. The Efest BIO V2 charger is compatible with most 3.7V Li-Mn or Li-ion batteries like 10440, 14500, 14650, 18500, 17670, 18650, 18700, 26500, 26650 etc.